Art Basel’s “Art Salon” is an informal way to encounter leading personalities in the art world. It is also a good way to meet artists at the forefront of innovation. This year, Art/43/Basel and Liste17, the International Young Art Fair, invited Morgan Wong, a young artist from Hong Kong, to perform and talk about his current projects. 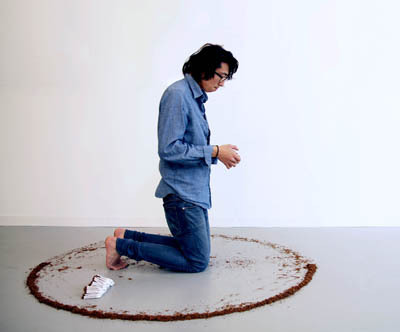 Born in 1984, Morgan Wong belongs to a generation of artists that forces us to reconsider the core of contemporary art. 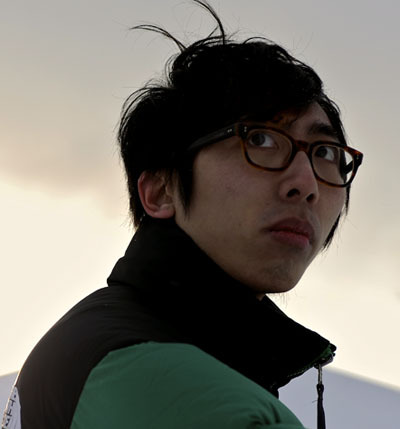 Morgan Wong is both influenced by his own cultural environment and responds to it. His projects are an exploration of a global experience in which he wants to be personally involved. His first projects primarily involved video and installations. Today, performance enables him to go beyond his own boundaries. It is a personal involvement that allows him to translate the materialized passage of time into a meditative travel. 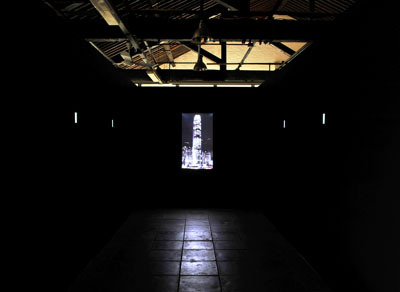 In 2012, Morgan Wong’s work was presented in the Moscow Young Art Biennale at the Moscow Museum of Modern Art. In 2010, he exhibited at the Tate Modern in the UK in a group show called “No Soul for Soul.” After Art Basel, we met again the artist in Geneva at the Maison Baron (Embassy of Foreign Artists: http://www.eofa.ch), a residence for foreign artists. Could you describe your video installation «Untitled - Agnosia Series I » ? It is a very interesting work on the desconstruction of a building that you have fragmented into themes of light and color. It seems that you transfer material and form into other codes. For me, this project is more a relationship between what we see when we go in the street –our perception- and what you are showing that we do not see at first. Yes, something more abstract is happening here. It is a re-investigation of the city. Before, I was based in Beijing and when I came back to Hong Kong in 2011, I received a project from Videotage, a non-profit art organization dealing with video and interactive media. I had a residency with them. At that time, I was researching Mark Rothko, about his inference concerning the transformation of city life into the perception of life through the field of color. I am interested in modern ways to do this, and also to see how the perceptions of people in the city change. I wanted to see the city in a different way. I took a very prominent building in Hong Kong, the IFC Two building, which is the tallest building in the island. I started to deconstruct it by zooming inside windows and changing them into a color-field painting or in this case a color-field video. The video deconstructs the normal perception of the building and forces the viewer to see it in a new way. It is a link to real life. The whole work is in between a complete abstract work and the reality of life. Your work in this video reminds me of the work of the photographer Hiroshi Sugimoto who also treated famous buildings with the interference of light that makes them pass from solid forms to diaphaneity and vice-verça according to our distance from the photograph. Your work, too, deals with different planes… First we have the material one with the physical presence of the building. You then transform this real plane into an abstract one with the deconstruction of the building into fragmental images. Yes, some people told me that this video reminds them of Andy Warhol’s Empire, in which the building is also a very sexual symbol dealing with time. Time is a very important notion in my work. The images of the window become a meditative experience for the viewer who can go inside the window, which has become an element of color. The viewer can embrace the whole experience through the color and also through the movement of other people that pass in front of the window. In Hong Kong in 1984. Around 2009-2010, I started to travel around Asia and Europe. I moved to Beijing in 2009 and stayed there for almost two years. 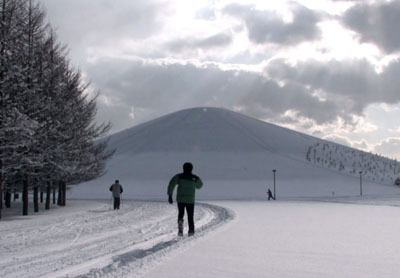 In between, I took a residency in Sapporo, Japan. Then, I went back to Beijing until the end of 2010. At that time, I started to think of getting a Masters degree. I was accepted in London, where I am now, doing my Masters at the Slade School of Fine Art, University College London. Why did you go to Beijing ? After completing my BA, I worked for a few years. Then, I decided that it was time for me to move, to see another scene, to get some fresh inspiration. I decided to see other parts of Asia and, hopefully, Europe. As an Asian artist, I chose Beijing first, because this is the place for the arts in Asia now. I worked in a gallery, The Beijing Commune, in the 798 district. In parallel, I also had my own space to work as an artist. Looking at your website, it appears that video is your main vehicle for creativity. Why is that ? Do you plan to explore this medium further ? I won’t say that my major medium is video. Right now, I feel that I am in a phase in which I can embrace everything, depending upon the concept I want to explore. I am also starting to develop works on a larger scale, incorporating different experiences and media together : video, performance, drawings, sculpture, installations. To answer your question, I developed video because of my educational background. I have a bachelor degree in Creative Media, which essentially deals with photography, video and digital technology. At that time, I was very interested in understanding how video is used as a medium to express ideas. I am also interested in Tableau Vivant or living picture. Things happen within the screen like when you face a window and see things happening. This influenced my style in a work like « Demolishing Rumor ». It is very static, but a lot is happening within the screen. In which language were you raised ? Mandarin or Cantonese ? In Cantonese. But I speak Mandarin as well. It is a question for me, because being raised in one language (Cantonese), but living in an environment that allows you to learn other languages, how do you experience the passage from one mental framework to another ? In some of your videos, you tackle the notion of understanding communication between people. For that, you use Chinese characters. Why ? The knowledge of different languages brings me to an interesting approach to people of different cultures. In Japan, I did a project with a Japanese chef who cannot speak Chinese or English. And I cannot speak Japanese. Basically, we could not communicate through spoken language. But, we shared Chinese characters due to historical context, so we found a common cultural way to communicate by writing. Throughout the two months of residency I spent in Japan, I started to realize that I could share things with him, about his life, his philosophy. It is like an engagement of people with or without language. That is your video installation « A Story of an Eel Chef » (2010). There is a universality that brings you together : in this case, the Chinese characters, which have existed in the Japanese language for over a thousand years. But to what extent could you plainly exploit this communication with him considering that both languages have evolved over the centuries ? Isn’t there an element of alienation here ? In fact, I kind of enjoy the miscommunication. For the exhibition, all the material was in Chinese, but I put everything into a Japanese context. There is also a story in Chinese that I wrote about the Japanese chef. The writing on the handtowels is in Chinese characters that he and I have written to « speak », and the video is in Chinese too. For me, at that time, I was in Japan and I could not understand Japanese, but I could guess the meaning of what we were talking about through the Chinese characters. For the Japanese audience, there was a twist too. They saw all the material laid out like a performance and they had the same feeling as me of having to guess the meaning through characters they could recognize. There is a bilateral alienation in this project. From the « conversation » you had with the eel chef, what did you choose to write on the handtowels ? I selected words or sentences that we have actually exchanged in writing. I used the same writing, the same calligraphy, and put it on the handtowels. Basically, these words are the ones that helped us to communicate. How did you do the final selection ? You exchanged much more words than the ones found on the handtowels. The selection was based on how memory is important to me. One of the handtowels mentions the tea ceremony. I remember asking him his general impression on art. He told me that he has a daughter practicing the tea ceremony. This is his introduction and understanding of art. For him, art is a means of engaging in philosophy or meditation. There is a parallel with the tea ceremony. I also chose to write where he lived and where he used to work. A series of nice memories about him. In total, there are about one hundred phrases stitched on those handtowels. For the presentation of the project, you had a drape with Chinese characters hanging from the ceiling and napkins on the floor. People could walk on that installation. The screen hanging from the ceiling is also made of handtowels. I stitched handtowels together and this became a large screen. The use of handtowels is a reference to a Japanese tradition of giving a handtowel to guests in a restaurant. 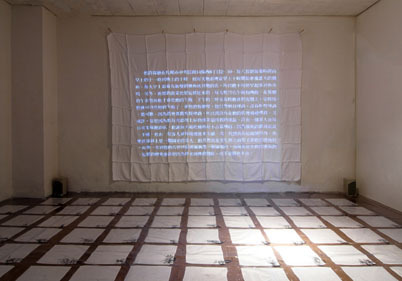 There were also paragraphs of Chinese characters projected on a screen. These told the story I wrote based on what I heard from him. Through our conversations, I knew more and more about him and, eventually, I wrote a story about him. I invited him to the exhibition and we realized that there was some miscommunication here and there, which I think is the beauty of the work. What was his reaction when he saw the project ? He was interested to see which Chinese characters had been used. He was happy that our conversation became the link between the audience in Japan and him. It is a project in which an artist becomes a mediator between the audience – here, the Japanese people- and the subject – the eel chef. It was finally a way to link the local population together. During the opening, people were interested in grasping the story behind the Chinese characters. They actually asked me what happened to the Chinese characters that helped me to communicate with the Japanese chef. I became a link to them. 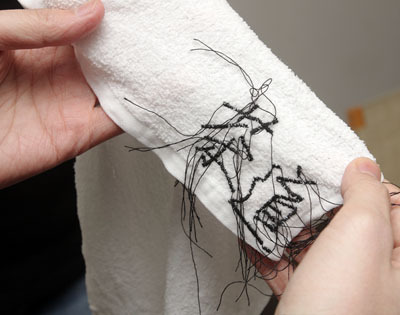 Could you give some examples of what was really written on these towels ? The tea ceremony that I already mentioned. Hokkaido for sure, because it is where he lives now. Another handtowel mentions 73, which was his age. We shared a kind of sad story, because he was working alone in the restaurant. I asked him why he did not have some help. He would need someone to whom he could teach his craft. He told me that he cannot find anyone who could be interested in the industry. This is a sad story, because he told me he would die soon and that his skill would be lost. It was really a coincidence. The first night I was in Sapporo, I tried to find a typical local restaurant. I ended up in his restaurant. Because he was very kind and he had that skill, I tried to talk with him. He was very open minded and he also tried to talk to me. At first, we tried to speak to each other… it did not really work ! I tried to write and see where that could lead us. That was the starting point of the project. Time and Space are two themes that you develop in your projects. In that context, could you talk about two interlinked projects done in 2010 dealing with these notions. 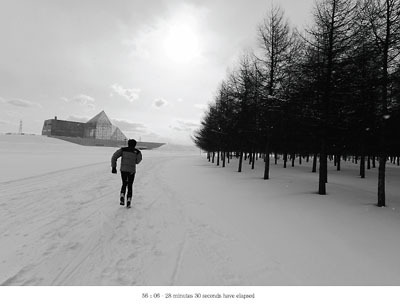 « Plus-Minus-Zero », a video, and « 56 :06 », a photograph, both related to a performance that was done earlier. The idea came from your reflexion on time and the meaning of time difference after you sent a fax to Hong Kong while in residency in Sapporo. When I was doing my artist residency in Sapporo, I received an invitation from a curator for an exhibition at Para/site Art Space in Hong Kong regarding fax technology. After that, I started to think about the idea and thought I should take advantage of my location. I decided not to send a work that was already done. It did not make any sense. I thought about the time difference between Hong Kong and Japan. I like to be involved in how an action brings a concept into reality. The performance was in an amazing park setting. It was a circle of trees forming a small forest. I just walked backwards and anti-clockwise around that forest for one hour seemingly to bring the two places closer. Because it « is » the exact time difference between Sapporo and Hong Kong, neglecting the time spent in the process of sending the fax. It is an interesting project, because it seems that fax is a technology that is less and less used. Yes, it is an idea that the Independent Curators International (ICI) started some 30 years ago. They conceived it as a shuffling project. It started in New York and it was in Hong Kong at the time I was sollicited. The curator there contacted several artists and asked them to use different media to embrace the notion of time. I was then involved in the project using fax technology. This project was in fact my first attempt to see how time can be materialized. This year, I was invited to do a performance at Liste17 in Basel. « Deciding Whether to Worship His Own Power or the Power of His Own» was a mythical and durational performance which materialized time. How would you define and configure simultaneity between events ? In this project, walking backwards is an attempt to recuperate the time between you, your action and different places. Sending the fax of your project takes place at one point in the universe, but it triggers another event or even a chain of events that compose time. Yes and it also works as a meditative project. Meditation is composed of repetitive actions. In Japan, that was done under hard physical conditions. I would say that it is like going into a trance under which I no longer feel time nor space. "Deciding Whether to Workship His Own Power or the Power of His Own"
In the performance « Deciding Whether to Worship His Own Power or the Power of His Own», I was surrounded by a circle of tobacco. I was kneeling on the ground and I rolled cigarettes for eight hours. The idea comes from a quote of a prominent scientific research, which said that eleven minutes of your life are reduced if you smoke one cigarette. It was a sort of imaginative and suicidal performance for me. This performance also refers to the performances done by previous artists who experimented first with the notion. They used the body as a vehicle for communication and they used it most of the time in extreme condition…something that challenges you with the fact that you can die. In my performance, at first, you do not see the harm that can take place. Eight hours kneeling on the ground is nearly torture. Yes, by the end of the performance, I could not really feel my feet. But still, at that moment, I was O.K., because I was becoming a machine. I went into a trance. At that point, it became a meditative stage for me, which I always enjoy during my performance. At this point, I would like to go back to your use of Chinese characters. We have already seen how you used them to establish communication between people who do not have a spoken language in common. In « Alliance», an interactive installation with a motion sensor, you play with Chinese characters and you lay-out a map to re-enact or trigger a variety of meanings. The notion of unpredictibility is essentiel to unveil new nuances about which we do not think at first. Random juxtaposition is instrumental in turning the viewer into a user. It is a project in which I celebrate the richness of Chinese characters. It is, as you say, like a map for Chinese characters. With one character, you can form meanings, phrases by adding it to many other characters. I started with the word « alliance » and then I created several phrases or new words from it. One word leads to another word and that new one leads to another one, and so on. Eventually, it becomes a loop that goes back to « alliance. » This is the first step of the work. For the second step, I make connections between characters. It is not as simple as having « alliance » match with another character. It can match with so many characters inside the loop that it transforms itself from a very linear loop to a network. It then works as a map. The last step is controlled by the audience. It is an interactive installation : the audience can walk around to place the characters to different positions. Then, some accidental meanings can happen like some slang or even some meanings that we cannot find in a dictionary. Actually, there is a big screen and people move in front of it. The characters move according to the movements of the people. It is a sort of ping-pong game…. Yes, because you finally try to move to make links, to shift one character to another one, but then there is the unpredictibility, a surprise ! Something new comes along. 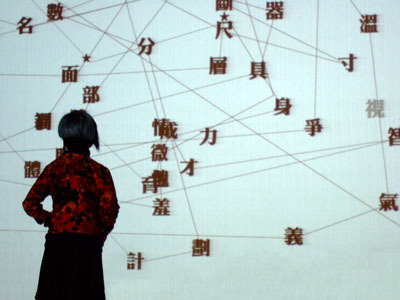 What is your goal when you use Chinese characters in a performance or an installation ? You have several projects dealing with Chinese characters. Are you looking at a more global integration of Chinese into the world vernacular ? « Alliance » is an earlier piece done in 2007. The story with the eel chef is more recent (2010) and goes back, in a sense, to my earlier work. In the project done in Japan, it is no longer a celebration of Chinese characters. It is about how Chinese characters are embraced by different cultures. In this case, by Japanese and Chinese cultures. I am thinking of new projects that can take Chinese characters into new dimensions. At the same time, works that deal with meditation and performing elements, which are imbedded in Chinese philosophy. It is a lesson on how you can calm yourself, how you can meditate to go to another level. You live in London now. Are you working on a specific project ? It is more like a work in progress. I am doing a Masters degree and I will make my graduation exhibition in 2013. At the same time, I have some projects in my mind that I would like to actualize. One of them would be an extension to a work I did in April 2012 in Ireland. Also, it is the first time I stay in Europe. What are the themes you have explored so far and that you would like to continue to develop ? Why are you interested in these themes ? I am very interested in how time is being materialized and how things are being translated, how the immaterial is materialized. Actually, Chinese characters are also a translation. They are a translation of meaning to another culture, or into other meanings that the audience gets. I would like to pursue my work in that direction. Also, I am interested in performances, because I enjoy being in a meditative state. Performance is for me, while the by-products (video, installations, photography) are for the audience. They are like a medium for the audience to understand how to get into my performance, and so to my thinking. You want to be personally involved. For me, it is the most important part. This is where I reach art. Morgan Wong Wing-fat’s work is featured in a new book, « Hong Kong Artists/20 Portraits », the first international publication presenting twenty visual artists established in Hong Kong. Putting artists from Hong Kong into perspective is especially relevant today. In June 2012, Uli Sigg, a Swiss collector of contemporary Chinese art, annonced the gift of a large portion of his private collection to the M+ museum in Hong Kong, which will open in 2017. Uli Sigg, a former Swiss businessman and diplomat in China, acquired a historical collection over the past 30 years. The donation of 1,463 art works, valued at $163 million, includes works by more than 300 artists. The M+ museum, built by the British architect Norman Foster, is part of a larger cultural development in West Kowloon, including theaters, exhibition centers, residential quarters and parks. 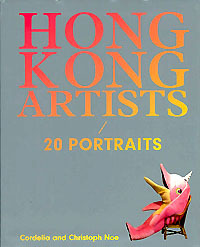 « Hong Kong Artists/20 Portraits » is edited by Cordelia and Christoph Noe. In 2005, the couple created « The Ministry of Art », a curating, advising and publishing operation focusing on young Chinese art. Their previous book « Young Chinese Artists – The Next Generation » was published by Prestel.